The normal processes in an aquarium cause the bio system to become unbalanced allowing unfriendly bacteria and algae to take hold dominate and then negatively impact on your aquarium's water quality. 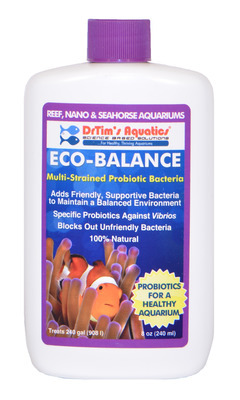 Use�once per week as a natural way to keep your aquarium healthy, clean and in balance. Good for 6 months at room temperature, or 1 year at 10C. �Keep refrigerated for longest shelf life. Maximum dose 10 ml per 10 gallons (38 Litres) of aquarium water. For best results turn skimmer and UV off for 8-12 hour, if the water turns cloudy turn on as soon as possible.